Tundra™ Xtreme ProLite 2.5 Rotax® 600 H.
2018 Ski-Doo Tundra™ Xtreme ProLite 2.5 Rotax® 600 H.O. 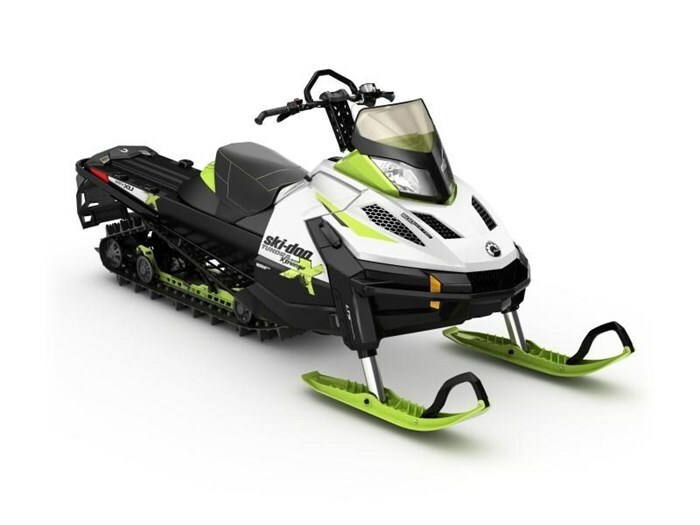 E-TEC® REV-XU S LEV 154 SPORT-UTILITY TAKEN TO THE XTREME One look and it’s obvious this is no work sled. We took the go-anywhere Tundra and amped it up with a powerful 600 H.O. E-TEC engine, performance shocks and other goodies to make the most unique off-trail play sled in the industry. REV-XU PLATFORM RUGGED AND CAPABLE This base architecture and design sets the standard for light weight, durability and handling. Flexible riding position enables comfort sitting and standing. Driver can stretch their legs due to forward foot position. Cab and bottom pan shapes are optimized for flotation and snow flow. Styling is rugged and dynamic. ROTAX 600 H.O. E-TEC ENGINE BEST SELLING, BEST PERFORMING The 600 cc-class benchmark for fuel economy, oil economy, smoothness and ease-of-use. Up to 21 mpg (11.3 L/100 km) trail fuel economy. Virtually no two-stroke smoke and smell and easy starting. Preparing for the off-season is easy with built-in automatic summerization function. No wonder it’s the best-selling 600cc engine in snowmobiling*. 120 horsepower *Based on retail sale results as of December 31, 2016. REV-XM LIGHTWEIGHT SEAT COMFORT WITH STORAGE Its low profile design gives you all the room – and comfort – you need to move around and take control. Plus, there's 0.8 gal/3.2 L of storage in the rear. LTS FRONT SUSPENSION SPECIALIZED FOR DEEP SNOW Industry-exclusive telescopic front suspension enables a large, flat belly pan for exceptional deep snow flotation. SC-5U REAR SUSPENSION SPORT-UTILITY VERSATILITY Our sport-utility suspension. Refined ride both on trail and on top of powder. Articulated rail to maximize deep snow traction in reverse or locked out when towing. PILOT DS 2 SKIS DEEP SNOW CONTROL Single-keel with excellent sidehilling bite, thanks to thin outer edges. Narrow and thin, yet stiff. Shorter behind its complementary spindle with flat tail for easier counter-steering and sidehilling. REV-XM RUNNING BOARDS ALL CLEAR Massive, strategically shaped openings keep the boards clear. A tall extruded edge adds stiffness and has aggressive boot grips. LINQ SYSTEM (OPTIONAL) INSTANT CONNECTION Our cargo attachment system is the hassle-free way to connect cargo bags, fuel caddy, snowboard/ski rack to your sled in seconds. The LinQ system is standard on this model and comes with four clips.